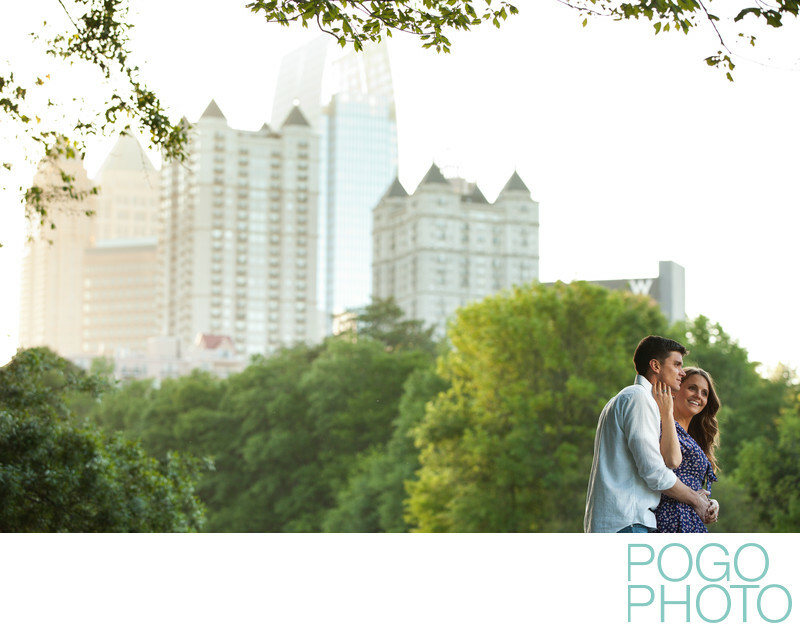 Our clients often ask us to come to them for a personal take on their engagement portraits; in this case we traveled to Atlanta, Georgia, a jewel of a city in the deep south. Piedmont Park has the unique setting of being right next to the city's high rise buildings; much like Central Park in New York City, this means that you can create images that look like they're in the deep woods or a rolling field in the countryside, or you can turn around and position towering buildings in the background for a sense of scale and modern urban appeal. The light glow from the setting sun is rim lighting the couple in this portrait while making the buildings in the background feels both looming and in a fairytale world of glowing color and mist. The treeline seems like it may be eating up the city, and the lack of other people in this shot makes the couple feel isolated and alone. We chose to fill a bit of light onto their faces to allow the colors to pop and their features to be more defined; this use of off camera flash and late afternoon daylight can be a very powerful combination. Location: Piedmont Park, Atlanta, Georgia. 1/500; f/4.0; ISO 1000; 105.0 mm.